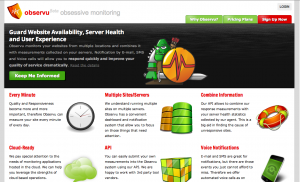 For the past two years, I’ve been working on one of our products: Observu, a site and server monitoring platform. The last year we’ve applied it to our existing sites and customers and now we feel it’s ready for others to see and use as well. It took a bit longer than anticipated, due to other projects and responsibilities taking up time, but we’ve always kept determined to get Observu ready to launch. I definitely do not feel like we are done now, having it out in the open now is just the start to find out which direction we should go. We’ve got so many ideas, but we can’t execute all of them right away. Your feedback will be greatly appreciated and help us guide further development. This entry was posted on Sunday, February 10th, 2013 at 2:16 pm	and is filed under business, Webdevelopment. You can follow any responses to this entry through the RSS 2.0 feed. You can leave a response, or trackback from your own site. A 33 year old entrepreneur and developer. I am currently obsessed with monitoring at Observu. My main activities, besides coming up with ideas, are: Xamarin.Forms, Python, PHP programming and Design.